Stevenage is located in north Hertfordshire between Junctions 7 and 8 of the A1(M). It is a major commercial centre with a particularly strong presence from the pharmaceutical, aerospace, defence and computer sectors. 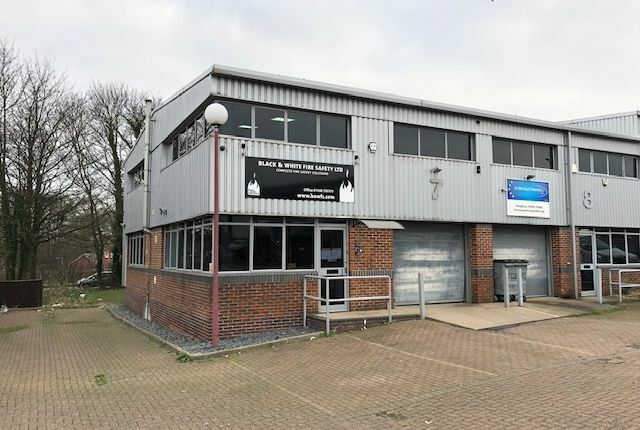 This property is located within the Pin Green industrial area which is towards the north east of Stevenage with a dual carriageway link direct to the A1(M). The property is constructed of a steel portal frame with elevations attractively finished with feature brickwork at ground floor level and profiled silver coloured vertical cladding above. There are windows to the front and side of the property. There is a small loading facility to the front. The property forms part of a terrace of 4 fronting onto a brick paved courtyard at the centre of the development. The first floor is fully fitted out as offices with carpeting, LED lighting within a suspended ceiling and kitchen. In addition, there are air-conditioning units. There is a particularly attractive feature entrance and circular staircase rising from the ground floor including toilet accommodation. The ground floor space is finished with a suspended ceiling and is currently used for storage purposes. The property would be suitable for a wide range of office, light industrial office and studio type uses. There are 4 allocated car spaces. Price £399,950. VAT not payable. Please see the Valuation Office Agency website. Indicated Assessment £16,700. For further information please contact Davies & Co.
Property descriptions and related information displayed on this page, with the exclusion of Running Costs data, are marketing materials provided by Davies & Co, and do not constitute property particulars. Please contact Davies & Co for full details and further information. The Running Costs data displayed on this page are provided by PrimeLocation to give an indication of potential running costs based on various data sources. PrimeLocation does not warrant or accept any responsibility for the accuracy or completeness of the property descriptions, related information or Running Costs data provided here.